A financial assistance program has been established to aid students in attending Samford University. Federal and State financial aid in the form of grants, loans, and on-campus job opportunities is provided to assist students in meeting the financial responsibilities they incur at Samford. These programs are based on financial need as demonstrated by approved financial assessment instruments. In addition, the University provides scholarships, based on criteria such as academic achievement, leadership skills, need, athletic ability, or field of study. Nearly all financial aid programs at Samford are administered by the Office of Financial Aid (OFA) within Student Financial Services (SFS). Application for financial assistance begins when the student applies for admission to Samford University. All students are urged to file the Free Application for Federal Student Aid (FAFSA) in order to be considered for all types of assistance. The FAFSA may be filed at www.fafsa.gov. An application priority date of February 15 has been established for 2017-2018, with students meeting this priority date comprising the first group of students awarded aid for the upcoming academic year. The FAFSA will be available on October 1, 2017. The application priority date is still to be determined. The financial assistance received may be from one source, such as the federal government, or may represent a combination of sources, such as the federal government, the state of Alabama, private donors, the Alabama Baptist State Convention, the University, and lending institutions. Financial aid packages are based on the number of credits taken by a student. Some programs require that a student be enrolled full-time. Packages may be adjusted should the student not be enrolled full-time. Federal Pell Grants are need-based grants that are available to eligible under-graduate students earning their first bachelor’s degree. Students may receive a pro-rata portion of a full-time grant for enrollment less than 12 hours. Federal Supplemental Educational Opportunity Grants are awarded on a first-come, first-served basis to our most needy Pell Grant recipients. Federal Perkins Loans are need-based loans awarded on a first-come, first-served basis to eligible students. Federal Stafford Loans are available to students who qualify. The application process begins with accepting the loan online through the student portal. There are two types of federal Stafford loans: subsidized and unsubsidized. Need-based Stafford loans are subsidized (interest is paid by the federal government). For unsubsidized Stafford loans, interest is charged on the loan from the time funds are disbursed. Eligible freshmen may borrow up to $5,500/year, sophomores $6,500/year, juniors and seniors $7,500/year, and most graduate/professional students $20,500/year. Federal Parent Loans for Undergraduate Students (PLUS) are available to parents of dependent undergraduate students. Eligible parents may borrow up to the difference between the estimated cost of attendance and all other financial aid per year. Federal GradPLUS loans are available to students who qualify. Students may borrow up to the difference between the estimated cost of attendance and all other financial aid received per year. Students must file the FAFSA in order to be considered. Health Professions Student Loan Program provides loans on a limited basis to students in the McWhorter School of Pharmacy. These loans are awarded on a first-come, first-serve, and need-based basis to eligible students. Parental data on FAFSA is required, even if student is independent. Federal Work-Study provides on-campus and off-campus employment to students. Work-Study awards compensate students for actual hours worked. In order to receive financial aid, a student must be making satisfactory academic progress, as defined below. Eligibility for financial aid will be evaluated at the end of each academic year. In the evaluation process, all grades of W (Withdrawn) and INC (Incomplete) will be counted as credits attempted but not passed. Repeated courses will be counted as attempted. Students cannot receive aid after they have attempted 134 percent of the credits required for completion of their academic program. Accepted transfer credits will be used to reduce that time frame. Graduate, doctoral, and professional students will be reviewed at 134% of the credits required for completion of their academic programs. Qualitative-Students must be accepted for admission and be eligible to enroll in classes. In addition, students must achieve and maintain a cumulative 2.00 GPA on all Samford University and transfer coursework. Quantitative-Students must average passing 75 percent of all credits attempted and applied to their current program. Both Samford and transfer attempts are included in the 75 percent calculation. Qualitative-Students must be accepted for admission and be eligible to enroll in classes. In addition, students must achieve and maintain a cumulative 3.00 GPA on all Samford University and transfer coursework. Students who are notified of their inability to meet the SAP (Satisfactory Academic Progress) standards will be offered the opportunity to appeal the decision. A successful appeal will be based on whether or not a student’s performance was affected by personal injury or illness and/or death of an immediate family member or relative. Immediate family member is defined as mother, father, sibling, spouse, child, and grandparent. Also, a successful appeal will outline what has changed in the student’s situation that will allow for him or her to be successful, academically, in subsequent academic terms. Alabama Student Assistance Grants are awarded on a first-come, first-serve basis to our most needy Alabama resident Pell Grant recipients. Alabama Student Grants are available through a state entitlement program for undergraduate Alabama residents attending accredited private postsecondary institutions in Alabama. Need is not a factor and grants (subject to annual variations in funding) are available to non-church vocation majors. The application may be found on the Student Financial Services Web site: www.samford.edu/departments/financial-services. The University provides numerous opportunities for earning scholarships. The Admissions Office is responsible for awarding the bulk of Samford scholarships as students enter as freshmen or transfers. For a listing of current scholarships awarded through the Admissions process by the Admissions Office or in conjunction with that office, please see www.samford.edu/admission/scholarships. Scholarship maintenance and renewal requirements are found here and in the online student portal. Upperclassmen, graduate, and professional students may receive some scholarship funding from their academic programs. Academic programs should be contacted directly to determine scholarship availability. tudent Financial Services does not award any merit-based scholarships. Samford competes at the Division I level of NCAA athletics. Athletic scholarships are awarded through the Department of Athletics. Please contact the team in which you have an interest to obtain additional information concerning the recruitment process and availability of athletic scholarships. Certain restrictions may apply to the payment of campus housing costs with university-funded aid. Specifically, full-ride scholarships will not cover the full cost of living in the West Village. The maximum amount a full ride scholarship will cover is equal to the double occupancy rate of the next highest housing option below the West Village. For most Samford scholarships, students are given a one-semester grace period to raise a deficient cumulative Samford grade point average to the appropriate standard. During this grace period, the student is typically allowed to keep their Samford scholarship. If, by the end of the grace period, the cumulative Samford grade point average is not sufficient, the scholarship will be forfeited immediately and permanently. Also, if a student is found to have violated the University’s Code of Values, sanctions may include revocation of some or all Samford-funded aid. Students who are veterans or dependents of veterans may be eligible to receive benefits through the U.S. Department of Veterans Affairs (VA). Contact the Office of the Registrar and your VA representative. The telephone number to call concerning veterans benefits for students in the State of Alabama is (888) GIBILL1 [888-442-4551]. 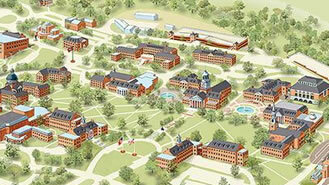 Samford University is approved by the VA as an eligible institution for federal benefits. In addition, the VA requires that each time a student attempts a course, the grade received must be included in the cumulative grade point average. 1. Be admitted to a degree-seeking program or to an approved NCD (non-college degree) program. See the School Certifying Official for details. 2. Establish eligibility for VA benefits by completing the appropriate paperwork with the Office of the Registrar or with a VA Service Office. Four to six weeks are required by the Department of Veterans Affairs for processing. All veterans (Chapters 30 and 32), reservists and guard members (Chapter 1606, 1607), and veterans’ dependents (Chapter 35) are responsible for paying fees and charges on the same basis as other students. Veterans under the Vocational Rehabilitation Program (Chapter 31) should make arrangements for their tuition, fees, and books to be paid prior to their first payment due date by working with their assigned vocational rehabilitation counselor. Veterans using Chapter 33 (the Post 9/11 GI Bill®) must coordinate with the School Certifying Official (Office of the Registrar, Samford Hall) prior to the beginning of each term so that all paperwork can be filed, ensuring that Chapter 33 tuition/fee benefits are sent directly from the VA to Samford in a timely manner. While VA Payments are usually received regularly, Chapter 33 students are advised NOT to depend upon VA Housing Payments for the payment of rent or other vital expenses.